Hello my name is Bree Labiak. I love to surf and skateboard. 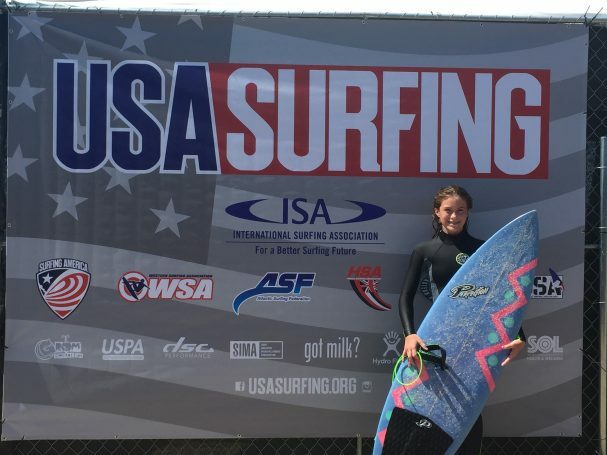 I am number one in the Mid Atlantic ESA Surfing Regional Championship for under 14 , under 16 , and under 18. I surf at 13th avenue south in the town of Surfside Beach.I go surfing just about every day either with my coach Rayn McDonough/r my other friends from 13th. I also have cystic fibrosis. The salt water helps me with my lungs so I am a really healthy kid. I think that every single child with Cystic Fibrosis should go to the beach, Salt Water Heals All. Tell us what motivates you the most to stay fit. Bullying. When 2 kids from 13th bully me it motivates me so much… it makes me mad and makes me want to go out there in the water and blow their SOCKS off with my surfing. I don`t say anything when they bully me, I let my surfing do all of the talking. It says more than hurtful words. It just makes me stronger… every single thing these 2 bullies say makes me want to go out there and just show them there words don`t mean a single thing to me. Their words roll off my back. I’m also motivated to stay as healthy as possible and surfing is helping a lot with that. I got into surfing when I watched “Soul Surfer” this movie is about my favorite surfer Bethany Hamilton. Bethany lost her arm to a shark in 2003 and then went on to become a professional surfer. She is a wonderful surfer and everything about her is inspirational to me. Someday I too will become a professional surfer, I also hope to inspire people like Bethany does. Do you have a favorite athlete? My biggest inspiration is Bethany Hamilton. I love how she is so humble and positive. I also think it is amazing how she is so religious. Someday I hope I can meet her. I exercise to stay healthy, the salt water helps people with Cystic Fibrosis. It helps their lungs, and surfing is definitely a lot of “Vitamin Sea” for a person like me. Thank you for this opportunity and I hope this inspires other CFers to get out there and live!! !